No one likes increased taxes. And Shoreline residents do not like the poor quality of our existing sidewalks, or complete absence of them in many areas. Current financing of sidewalks is less that $200,000 per year. This has obviously been inadequate for maintenance and repair. The additional $20 car tab fee is not part of the Shoreline ADA Transition Plan. It is financing for maintenance and repair of existing sidewalks, which was determined to be of a higher priority than new construction. New sidewalks are needed and expensive, but stating $59M is slated for 4.2 miles of new sidewalk is disingenuous at best. Ideally we could build all 75 miles of sidewalk at one time. But this is not a single project like Safeco stadium. We would need to coordinate multiple contractors, utility representatives and others, at multiple locations, throughout the city, at the same time. Impossible. Proposition 1 is not funding for a specific project, but for a series of sidewalk projects throughout the City and over time. The City can finance new sidewalks by taking money from other expenditures such as parks and playgrounds, trees, crime prevention, human services support - or by increasing property tax or sales tax. This proposed sales tax increase is relatively small (20 cents more on a $100 purchase) and in line with our neighboring cities. Do you even know what the sales tax is in each city? And people from those cities will contribute when they shop in Shoreline. After detailed City research and study, and a year-long volunteer Citizens Advisory Committee, a means to prioritize which sidewalks need more attention than others was developed. Members walked streets and sidewalks in their neighborhoods and other areas. 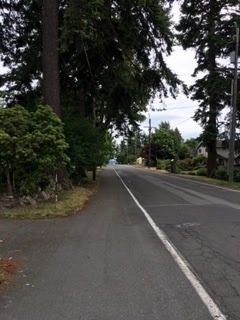 These sidewalks were not along vehicle arterials, as suggested by Megan Kogut in her Op-Ed, but neighborhood sidewalks you would take to the grocery, a doctor’s office, a bus stop, or a school. This information was available at two open houses and online at the City of Shoreline’s website. Feedback was requested and welcomed. Now it’s time to fix our sidewalks. Propose some cuts that will generate these funds. Pam, your letter shows significant misunderstanding of my op-ed and of Prop 1. I apologize in advance for being thorough instead of politely letting this go. But I need to correct your letter because voters deserve the facts. I didn't make up $59,000,000 for 4.2 miles of sidewalk. This is what Prop 1 is. The City of Shoreline doesn't exactly toot these numbers in public, but they discussed it in Council meetings. Please see the staff report from July 30, when Council voted to put Prop 1 on the ballot. The estimated price for each of the 12 proposed projects is on page 5, and the total of 4.2 miles of sidewalk is on page 6. No one is proposing to build all remaining 75 miles of sidewalk in the Pedestrian System Plan. (And that's just the Plan, not all neighborhood sidewalks in Shoreline.) That is infeasible. Those 75 miles were ranked in a list of about 150 projects, but only the top 12 projects would be funded. Prop 1 would not fund a single specific project, true. What is important about that is that, as I explain in my op-ed, Prop 1 utilizes a funding mechanism that cities use for a single expensive specific project such as a stadium. It's expensive because it's like taking out a 20 year mortgage, so you have to pay a lot of interest (in this case, interest is about $17,000,000 of the $59,000,000 collected.) My point is that that the multiple smaller projects in Prop 1 could and should be "pay as you go" to avoid debt and interest. And yes, over half of the proposed projects are indeed on arterials. See the Sidewalk Prioritization Matrix and the Pedestrian System Plan. Both are linked to from our website at https://shorelinesidewalksplan.org/faq/. Arterials are in the map and in the top 12 list of the matrix. Arterials were strongly preferred in the ranking system, so this is no surprise. You state that the $20 car tab fee is NOT for the ADA Transition Plan, but the car tab fee is actually directly for the ADA Transition Plan. See slide 3 in the Online Open House slides linked to from http://www.shorelinewa.gov/government/projects-initiatives/ada-transition-plan-project. You state that financing for maintenance and repair was determined to be of higher priority than new construction. We wish that were true. However, the new car tab tax generates about $800,000 per year for maintenance and repair. Prop 1 would generate about $3,000,000 per year for new construction, with repair possible if funds are left over. So if money talks, it says that construction is the higher priority. I have two opinions to add to the above reality checks. One, many people do know what the sales tax is in each city. I am happy for you if sales tax does not concern you. But many people think it's fair to consider the effect of a sales tax increase on their neighbors near the poverty level, of which there are many in Shoreline. Second, some members of the Sidewalk Advisory Committee mostly focused on repair of existing sidewalks, which ended up not being something they were allowed to vote on. It was, in my opinion, a bit of bait and switch. Watch the video at https://www.youtube.com/watch?v=kP0fU5xnCzQ. Building new sidewalk doesn't address mobility on our existing sidewalks. Pam, I appreciate your desire for sidewalks. I want them too, of course. And I want a new car. The real question is, should we go into debt to buy the new car? I think it's fair to accurately portray what is for sale and its price tag. You raise expectations unrealistically in your letter. Your last line is our line too. We want to fix first because fixing is 10-100+ times cheaper than building new, according to the City's numbers. It's like fixing the older car you have instead of buying a second new car instead. But the trick is, you still have to drive the old car most of the time. "Citizens Advisory Committee" which is basically code for people connected with the city who choose things that are important to them only. Once again lower-Ridgecrest gets left out. The city will gladly dump the light-rail station and unused bike-lanes on 5th that took away 1/2 the street parking. Vote NO! I'm a no. We are growing as a city, and maybe the city could make sure that new construction includes sidewalks, even if they are "patchwork".